The Sheridan Yellowjackets had to come from behind to defeat the Warren Lumberjacks by a score of 14-10 on Friday, October 16. After recovering a fumble at their own 26, Warren drove the ball to the Sheridan 22 yard line. Faced with a third down and six, the Lumberjacks passed to the end zone, but the pass was broken up by Scott Herron. David Damron put an end to the Lumberjacks’ drive with an interception of a fourth down pass at the 16. Sheridan ran over seven minutes off the clock as they drove 84 yards for the first score of the game. With 7:41 remaining in the first half of play, Gary Brown scored from one yard out. Larry Campbell kicked the extra-point to give the Yellowjackets a 7-0 lead. Warren’s Ricky Paskell returned the ensuing kickoff back to the Sheridan 20 yard line. On fourth and goal at the two, the Yellowjacket defense stuffed Warren at the one yard line. Moments later, the Lumberjacks recovered another Sheridan fumble at the Yellowjackets’ ten yard line. Sheridan’s defense held tough, though, and forced Warren to settle for a 27 yard field goal with 2:43 left in the half. In the third quarter, Paskell intercepted a Yellowjacket pass and returned it to the Sheridan 20. Two plays later, Michael Yon scored the only Warren touchdown of the game. The extra-point gave the Lumberjacks a 10-7 lead with 6:36 left in the third quarter. On Sheridan’s next possession, the Jackets faced a third and ten when Damron threw a 38 yard halfback pass to Bill Berry at the Warren 13 yard line. On first and goal at the two, Brown scored his second touchdown of the evening. Campbell’s extra-point gave Sheridan a 14-0 lead with 2:19 remaining in the third quarter. In the fourth quarter, the Yellowjackets forced Warren to punt, and Sheridan took over at their own 20 yard line with 9:49 left in the game. Sheridan never allowed the Lumberjacks to touch the ball again as they kept control of it for the remainder of the game to ice the 14-10 victory. Sheridan finished with 289 yards of total offense while holding Warren to just 107 yards. The Yellowjackets rushed for 237 yards and completed two of three passes for 52 yards. Individual leaders for Sheridan included: Gary Brown, 23 carries for 104 yards and two TD’s; David Damron, 16 carries for 84 yards; and Bill Berry, two receptions for 52 yards. Sheridan improved its record to 7-0 while Warren dropped to 3-3-1. After the game, Coach Campbell remarked, “It was a heck of a ballgame. That last offensive drive was super. The offensive line and the backs did a great job, and the defense had a couple of good stands. 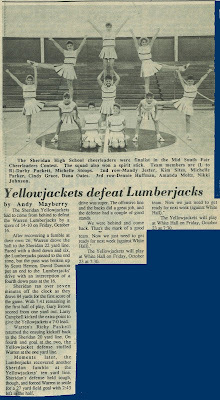 The Yellowjackets will play at White Hall on Friday, October 23 at 7:30.